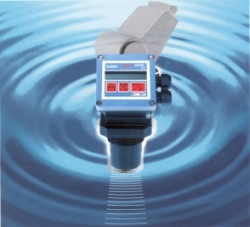 The Ultrasonic Level Transmitter Type 8175 combines an ultrasonic sensor and a transducer with a large 8-digit multi-language display in a splash-proof plastic NEMA 4 enclosure. The transmitter is powered with 18-32 VDC (optionally 115/230 VAC) and features a three-wire 4-20 mA output for direct controlling a continuous control valve, a PLC, or for monitoring. Two optional 3A relays can be configured as alarms or latched for automatic fill or empty operations. The transmitter Type 8175 includes a range of fail-safe features. Signal loss, power supply failure, level or temperature alarm can be activated with an adjustable time delay. A range of filter functions control the return echoes and automatically eliminate all interference due to elements of the vessel. Easy and fast commissioning is guaranteed with the Teach-In and Simulation functions. Different tank shapes (cylindrical, cubic, spherical) can be easily programmed via fixed default shapes or at complex tank shapes step by step. The measured value can be shown as a level, a distance (in cm, m, inch or feet), or direct as a volume (liter, m 3 , imp. gal, U.S. gal). The simulation functions allow the system to be tested under dry-run conditions. Burkert offers the Ultrasonic Level Transmitter together with process control valves as a complete, easy to control system. Easy commissioning, installation and operation makes the Burkert level control system number one in cost of ownership.